Large-sized glazing and light-permeable spaces - the modern architecture is almost impossible to imagine without them. However, at the same time, large-scale glazed structures should also consider relevant stability and other factors such as sound insulation and burglary protection. Our lift and slide systems deliver results in all factors. Thicker walls offer better energy efficiency, but it does not mean that we have to abandon the concept of open spaces. 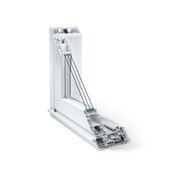 GENEO Lift and slide doors are made from high-tech material RAU-FIPRO which offers excelent energy efficiency. It allows to combine large-size glazing with excellent energy efficiency, sound and thermal insulation, as well as break-in protection. Sound insulation up to class 4.